Print one of these free bookshelf plans and you'll have everything you need to get started building a bookcase for any room in your house. The plans include diagrams, photos, step-by-step instructions, and sometimes even videos to help you along the way. Building a bookshelf is a fairly simple woodworking project that you can get done in just a day or two. It's a low-cost project as well and since the plan is free, you don't have to worry about busting through your budget. The free bookcase plans include a wide variety of bookcase styles and sizes so be sure to look through them all to find the best one for the space you have. Ana White has a free bookshelf plan that will get you this beautiful rustic wood bookshelf made of solid pine boards. This bookshelf plan includes step-by-step instructions, photos, diagrams, a materials and tool list, a cut list, and user-submitted photos of the bookcases they made using this plan. Complete the look by building your own headboard or even bed. The inspiration for this Industrial bookcase plan was taken straight from the pages of Pottery Barn. 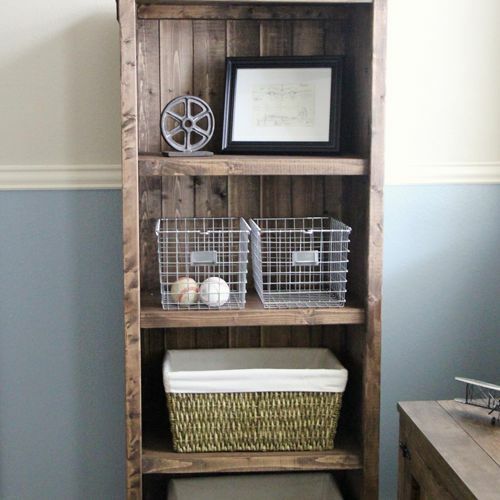 Building it yourself will let you have this beautiful bookcase for a fraction of the price. There's a required tools list, materials list, cut list, building instructions, diagrams, and color photos to help you while you build it. If you're looking for some tall, skinny bookcases you'll need to check out this free bookshelf plan from Infarrantly Creative. They're budget-friendly too, costing less than $60 each to make. You can build this Restoration Hardware inspired bookshelves with the provided cut list, building instructions, color photos, and finishing suggestions. Rockler has a free bookcase plan that will result in this gorgeous classic bookcase that uses walnut wood along with a mahogany stain. Three-pages of instructions that include photos and diagrams will help you get there. This free bookshelf plan will build you a large cubby bookshelf with adjustable shelves. Although you could put this anywhere in your home, it would look great in a kids room along with a custom toy box, bunk bed, and desk. To help you build this bookshelf, there is a free video tutorial and photos of user-submitted finished bookshelves. You'll also find diagrams and written instructions. This free bookcase plan will build you a beautiful bookcase in the Arts and Craft style but with a modern twist. The free PDF download of this bookcase plans includes diagrams, photos, and instructions. The Henry bookshelf was designed by Shanty2Chic for Ana White. It's the same design as the popular Hendrix Bookcase from Pottery Barn and you can build for a fraction of the cost. There's a shopping list, tool list, general instructions, diagrams, and color photos all included in the free plan. This bookshelf would look great in a living room surrounded by a custom coffee table and media center. Popular Woodworking has a free download of this contemporary bookcase plan that features clean lines to show off your books or other items. Use the instructions and photos to help you build this bookcase in a weekend. Here's another free DIY bookcase plan from Shanty2Chic, this one for a unique looking sawhorse bookcase that uses just 3 tools and can be built for less than $50 in materials. There's a full video on how to build the bookcase as well as written instructions and color photos. Here's a free bookcase plan for an oak bookcase. Included in the plan is a series of videos to help you complete your bookcase. The attached PDF file includes a lumber/hardware list and detailed diagrams. Here's another free bookcase plan from This Old House, this one for a 6-shelf built-in bookcase that you can adjust to fit your own space. Besides detailed building instructions, this free bookcase plan also includes diagrams, photos, and a materials and tool list. Family Handyman has a free bookcase plan that builds a classic Craftsman-style bookcase. All included in this free bookcase plan are step-by-step instructions, a list of tools and materials you'll need, as well as figures and pictures. Start Woodworking has another free bookcase plan and this one is inspired by the Arts and Crafts style of furniture. Plenty of diagrams and pictures as well as written instructions will help you build this unique bookcase. If you're up for the challenge this free bookcase plan will get you a beautifully finished barrister bookcase that is both elegant and functional. Use the PDF link at the bottom of the page to get the complete bookcase plan that includes instructions, photos, and diagrams. Popular Mechanics has a free bookcase plan that tells you how to build a bookcase that will fit any wall in your home. There are diagrams, pictures, and instructions to help you along all within this free bookcase plan. Here's a free bookcase plan that will get you a small bookcase with two shelves that are adjustable. With this plan, you'll get over 10 square feet of shelf space but it takes up less than 3 square feet of space on your floor. This free bookcase plan includes a tools list, shopping list, diagram, and step-by-step instructions. This free bookcase plan from Lee's Wood Projects will get you a simple but elegant bookcase that will last for years to come. There are photos, diagrams, a material list, cutting instructions, and building instructions in this bookcase plan.